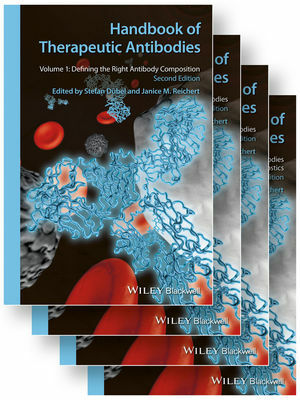 Still the most comprehensive reference source on the development, production and therapeutic application of antibodies, this second edition is thoroughly updated and now has 30% more content. Volume 1 covers selection and engineering strategies for new antibodies, while the second volume presents novel therapeutic concepts and antibodies in clinical study, as well as their potential. Volumes 3 and 4 feature detailed and specific information about each antibody approved for therapeutic purposes, including clinical data. This unique handbook concludes with a compendium of marketed monoclonal antibodies and an extensive index. Beyond providing current knowledge, the authors discuss emerging technologies, future developments, and intellectual property issues, such that this handbook meets the needs of academic researchers, decision makers in industry and healthcare professionals in the clinic. Stefan Dübel received his Ph.D. at the Center for Molecular Biology in Heidelberg, Germany, before moving on to the German Cancer Research Center in 1989 where he started research on the development of antibody libraries with naive or synthetic CDRs. In the following years, he substantially participated in the invention of antibody phage display, as well as other recombinant antibody technologies and the development of various antibody fusion proteins. In 1996, he moved to the University of Heidelberg to establish the antibody engineering group at the Institute of Molecular Genetics. He was appointed full professor at the Technische Universität Braunschweig in 2002, where he currently is head of the Department of Biotechnology and managing director of the Institute of Biochemistry, Biotechnology and Bioinformatics. He has co-authored more than 100 original papers, many patents, as well as several acknowledged textbooks in the field of recombinant antibodies. He is also on the editorial board of several scientific journals and cofounder of two antibody engineering companies. Janice M. Reichert is an internationally recognized expert in the development of antibody therapeutics. She is Founder and Managing Director of Reichert Biotechnology Consulting LLC, a pharmaceutical business intelligence research firm, and the founding Editor-in-Chief of "mAbs", a peer-reviewed, PubMed-indexed biomedical journal that focuses on topics relevant to antibody research and development. Dr. Reichert has published extensively on development trends for antibody therapeutics and she has presented her research results as an invited speaker at conferences held worldwide. She is President of The Antibody Society and serves on the editorial boards of several biomedical journals. Dr. Reichert received her Ph.D. from the University of Pennsylvania and her post-doctoral training at Harvard Medical School.